Click on the card for a better view. Sometimes, I love very simple cards with not a lot on it. So for today's challenge I am giving you a choice. The card above was done with Nellie Snellen's new embossing folder and the Memory Box Glowing Candle die that I layered 3 times. (more about that later) I loved the card this way as the focal point really stands out centered in the middle of this gorgeous embossing. Then, I decide to add more to it and I am anxious to hear your thoughts. Which card do you like best? 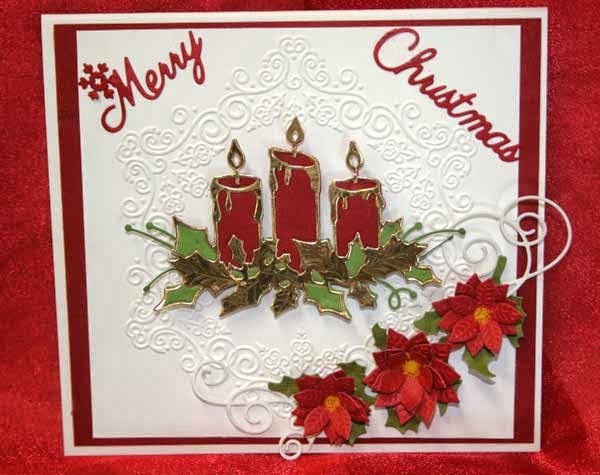 By adding some poinsettia flowers, flourishes and sentiments to the card, it has an entirely different look. I cut out the candle die 3 times. One time in red, one in green and the other in gold. then I layered the different colors to accomplish this look. I saw this idea on Pinterest from a video by Pam Sparks. You can see it by clicking here! To get the pieces to stay intact I put 2 pieces of packing tape on the back of the red paper before I die cut it. You will have until next Thursday, October 3 morning 6:00 AM EST to link your project. A winner will be chosen from a random drawing for week #39 the winner of the challenge will be announced Friday, October 4. This week's winner will receive a Nellie Snellen Embossing Folder. The winner will also be entered in the 2013 end of the year $100 gift certificate drawing. 3. Or if you are posting to the SCS gallery, you will need to use a special code to tag your card to the challenge. This week's code is joansgardens, JG0926 and needs to be posted with the challenge. Please enter both on the same line with a comma between as I have shown. I think they both are very pretty, the first one is stunning just as it is, the second one just takes it up a notch....both are very beautiful. I made a card a few weeks ago using this die, so it was great to see it used...I haven't posted it yet though. Beautiful cards, lowe the golden touch arround leaves and candels! I like the first one, Joan. It is simply beautiful and elegant. I like the first one Joan--it is very elegant, but I think a short verse on it would be nice. No contest.....the first clean and simple is my favorite!!!! Card #1 by a long shot is my FAV! The majority has it - the first. It maybe could use a small word or verse but the big MC and poinsettias are too much. It's first time I write on your blog. Joan, you make two very beautiful cards, but I love the first one, is so elegant! Greetings from Eva from the Netherlands. I think they are both beautiful, but the first one is simply elegant! I love the simplicity. Beautiful embossing folder and die! Well, both cards are gorgeous, for me personally I like the second one better, I like a cleaner looking card, but they both work, great job!!! Both cards are lovely - maybe a slight edge to the first - but I like the added verse. I am not sure if mine is simple or more detailed - a bit of both, too! Joan, You outdid yourself with both of your cards, as they are both very beautiful. If I had to pick, I would go with the first one, as your focus is on the beautiful candles. Wonderful new technique. Both cards are lovely! 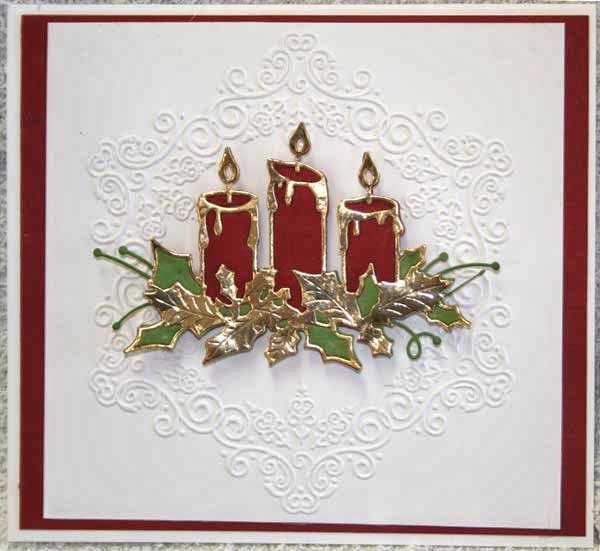 But I am becoming more clean and simple in my style of cardmaking, that is. 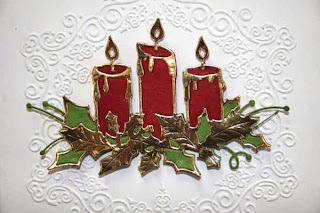 Love the technique on the candles. Both are gorgeous, Joan, but I do love the clean and simple look of the first card. 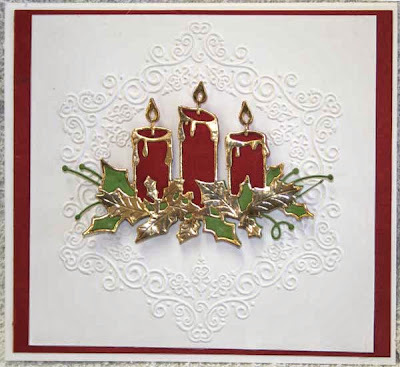 It just makes the candle arrangement stand out and show the beautiful embossing folder more. 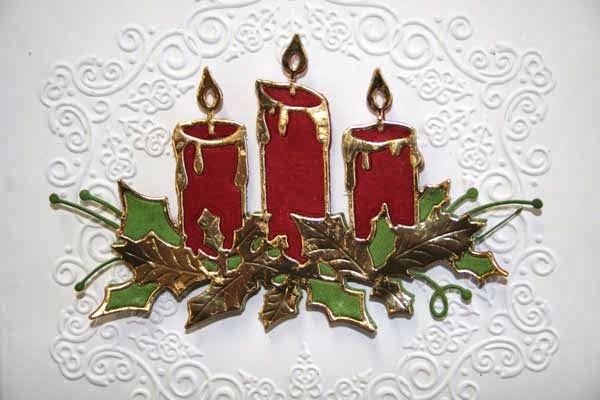 Love this card and almost bought this die for this year's Christmas cards. Nice job.